What do you get when you cross a Sherman VC Firefly's 17-pound cannon with a Centurion Mk. II turret? The British FV201 (A45), a Tier VII heavy tank! Packing a high damage per minute (that lets it deal far more damage than it takes) and powered by a Rolls-Royce engine, this Premium vehicle is ideal for protecting flanks and other defensive measures. 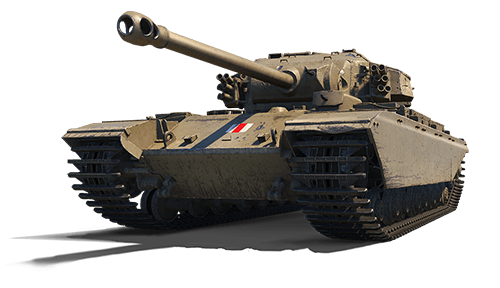 In Tier VII battles, the FV201 (A45) is a great front line breakthrough tank, with exceptional HP and decent armor. If there's an uncomfortable number of tier VIII and IX opponents, however, you'll find better results supporting your team around the front lines, not through them. Available in four sale-priced bundles!